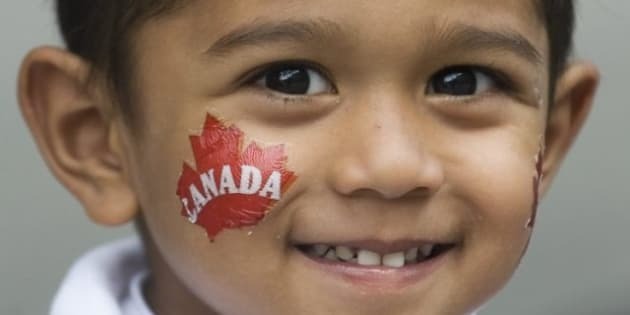 CBC -- There was plenty of high-spirited fun at Canada Day celebrations at home and at similar events around the world, as Canadians gathered to celebrate the country's 144th birthday on Friday. An ever-growing crowd of people in Ottawa congregated to catch a glimpse of this year's guests of honour, the newly married Duke and Duchess of Cambridge. Ahead of Prince William and wife Kate's arrival, RCMP said they were expecting a record 500,000 people to attend the festivities this year on and around Parliament Hill. Police later estimated that 300,000 people were there. Security officials opened the barricades to Parliament's West Lawn after a flag-raising and changing of the guard ceremony around 10 a.m. ET, two hours before the royal couple arrived. The weather was picture-perfect in Ottawa, with a high of 28 C forecast for the afternoon. In addition to the usual Canada Day hats and T-shirts, downtown souvenir stands were even selling a replica of Kate's engagement ring, which once belonged to William's mother, Diana, Princess of Wales. On this Canada Day, she would have marked her 50th birthday. There was no RCMP musical ride this year, to accommodate the large crowd. Elsewhere in the country, thousands of people turned out for festivities in Halifax, to enjoy everything from a parade to the 21-gun salute. Many wore red and white, but few were more dressed up than Jason Hubbard, who has stepped into the character of "Captain Canada" for the last eight years. Hubbard said every year he dresses in a cape, large red captain's hat and facepaint, and hands out paper flags donated by the city. Hubbard volunteers his time each Canada Day to go to various events around the city. In Calgary, the city's Canada Day celebrations were centred at Prince's Island Park and Olympic Plaza. A fireworks display was set to start around 10:45 p.m. local time from the Municipal Building. In Winnipeg, people gathered outside the provincial legislature. Participants were given red and white T-shirts and they then gathered to form a human, or "living," Canadian flag as seen from above. In Saskatoon, there was to be live entertainment all day at Diefenbaker Park after a breakfast, scheduled to begin at 8 a.m.
A pancake breakfast kicked off the day's festivities in Edmonton on the grounds of the provincial legislature. Other events were held at City Hall and the Edmonton Garrison. The first Canadian astronaut to walk in space, Chris Hadfield, spoke at the Alberta Aviation Museum and told a group of young people that the internet aboard the International Space Station is too slow to play online games -- but he doesn't mind because being at the station is way better than any game. In Vancouver, the Olympic cauldron was to be lit at Jack Poole Plaza, with performers like big-band leader Dal Richards onstage at Canada Place. The festivities were scheduled to end with a fireworks show over Burrard Inlet. In London's Trafalgar Square, where two days ago activists were staring down police during a protest against government austerity measures, there was a festive atmosphere Friday, as people were offered a taste of Canada. They were eating poutine and drinking Tim Hortons coffee. Some watched aboriginal dancers while others played street hockey. In the evening, many took in a concert featuring such Canadian acts Blue Rodeo, Lennie Gallant, Jill Barber, Alex Cuba, Karkwa and Devon Sproule. About 80,000 people who were born in Canada now live in London. Canadian troops serving in Afghanistan were treated to a BBQ, as well as a visit by three Conservative politicians. Defence Minister Peter MacKay, associated defence minister Julian Fantino and Public Works Minister Rona Ambrose were spending Canada Day in Kandahar, Fantino's office announced Friday. MacKay read a statement from the Duke and Duchess, addressed to the Canadian Forces, which said, "Godspeed your safe return to your family and friends, and to Canada." Joining the troops were special guests, including singer Amanda Rheaume, and comedians André-Philippe Gagnon, Rick Mercer and Mike Smith. The soldiers were treated to two beers each. "Who ordered the Iced Capps? You're holding up the line!" Smith joked in the voice of his Trailer Park Boys TV character, Bubbles. This may be the last Canada Day celebrated in such a way as Canada's combat mission in Kandahar starts to wrap up.